AIFD newsletter for March 29, 2019: April Fools' Day Party!!!. Dance to all your favorites, but stay on your toes! Tricks, pranks and alternative cuts will be the order of the day. Holly Plotner will mediate the mayhem assisted by Kathleen McDonagh, with thanks to Anne Alexander and Don Weeda for music suggestions. Teaching: Holly will again review 3 dances taught by Michael Ginsburg at the recent SAFDF: Vlach Tsamiko (Women's Tsamiko from Vlasti), Trajkiska Racenica and Sitna Lisa. Friday, March 29, 7-9:45 pm. If you’ve been sitting this fun dance out, now’s your chance to jump up and join in. During the month of April, Stephanie Anderson will be teaching basic Scandinavian dance skills and Hambo during Madeline Brock's regular beginner teaching sessions, beginning April 5th, at 7:00 pm. Join us! Do you or a fellow dancer have a birthday or anniversary in April? Come to folk dancing to celebrate with song, dance, and cake! Wednesday, 27: 4th Wednesday Scandi Jam!! 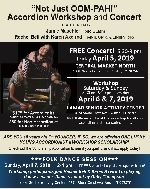 April 5-7: "Not Just Oom-Pah" Accordion Workshop and Concert. April 5: Free concert, Central Market North, 6:30-9. April 6-7: Workshop, Lamar Senior Activities Center, $175 for accordionists (includes all materials and lunch each day), $60 for Non-accordionists (Includes lunch each day). April 7, 2-4pm: Free folk dance session. Lamar Senior Activities Center. For complete details, including contacts and registration, check out the event flier, Vjeverica.com, or notjustoompah.org. SPECIAL CONCERT, ENGLISH COUNTRY DANCE, AND BIRTHDAY BASH!! 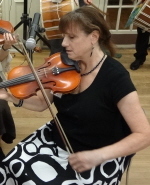 On Monday, April 8th, Elizabeth Stehl is having a birthday, and she would like to invite all her dancing friends to the Wildflower Terrace Ballroom, 3801 Berkman Drive, Austin, to help her celebrate with a special concert and dance with Rachel Bell (accordion) and Karen Axelrod (piano). Dances will be taught by Elizabeth and possibly others. Please arrive before 7:00 pm to ensure getting a seat at the concert (7-7:45 pm). Dance will be held 8-10 pm. A $10 contribution is requested to help pay the musicians' fees.